Titanic Rising is ranked as the best album by Weyes Blood. Members who like this album also like: A Moon Shaped Pool by Radiohead, ★ (Blackstar) by David Bowie and Carrie & Lowell by Sufjan Stevens. Related links: top tracks by Weyes Bloodtop tracks of the 2010s, top tracks of 2019. Showing latest 5 ratings for this album. | Show all 96 ratings for this album. Weyes Blood. Revealed to the public with her second album "The Innocents" in 2014, nobody could resist the enchanting and touching gothic folk of Natalie Mering. And over the years, his popularity will continue to grow with his successor "Front Row Sea To Earth" in 2016 and his new album "Titanic Rising" published in recent days. 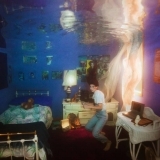 On "Titanic Rising", co-produced with Jonathan Rado, Weyes Blood chose to explore her rebellious adolescent years from a religious family and cast a rather detached look on tracks as well purified with "Everyday" than with the beauty of "Something To Believe" and the atmospheric and aquatic "Movies". She imagines a world that collapses like a Titanic on "Mirror Forever" and "Wild Time". Add this to a most sumptuous interpretation and twirling influences between 1970s baroque pop, you will get a perfect work where it is simply impossible to go back to the surface. The internet: Omg it's like Kate Bush, The Beatles, Bjork, Enya, Carole King, Roger Waters, Brian Wilson, The Carpenters, Nico, Joni Mitchell, my mom, and Whitney Houston got together and made an album!!!!!!! If Kate Bush joined the Beatles during Sgt. Peppers but then took her mask off and was actually Christine McVie. Her voice is reminiscent of Karen Carpenter. It doesn't help that the first half of the album seems to be a homage to the Carpenters. Second half drifts in and out. I really like her voice but the style is quite derivative. Amazing album, I didn't know the artist yet but on the first listen I was instantly hooked. Very pleasant sound with a bit of a psychedelic vibe. definitely my favourite of 2019 so far and a strong contender for my favourite album of 2019 in general. I mean, what is there to say? It's nigh-on perfect. This may seem like a strange thing to focus on, but the sequence of these tracks is so clever in the arc it creates, the songs themselves truly beautiful and haunting. Titanic Rising is one for the ages. Definitely an early contender for my favorite album of 2019 (along with Grey Area). Natalie Mering’s voice gives me Joni Mitchell and Nico vibes while still feeling completely new. The instrumentation is beautiful. There's the folky, twangy guitars, lush pianos, strings, synths... it's all perfect! Titanic Rising sounds like it exists outside of time too. It definitely has the folk and psychedelic sounds of the 60s and 70s but the production and mixing are all very modern. This is especially true on songs like Andromeda and Movies where the synth really transports you out of this world and into the future. I've already listened to the album three times and honestly I think my opinion of this album is only going to go up from here. Titanic Rising is an album I want to go around showing off to my friends. Can't say enough good things about it.